Robert Browne and I attended a public information session in Orillia on November 9th to view the presentation from Shim-Sutcliffe Architects Inc. regarding their conceptual plan for this project. Within this plan is an interpretive centre that was originally planed to interpret the 5000 + year history of the fish weirs at the Narrows. Robert and I have attended a few meets now and suggested that the interpretive centre could also be used to interpret the more recent history of Champlain's visit to the Narrows. 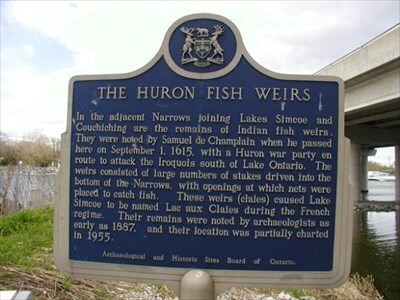 After all he was probably the second European to view the fish weirs and the first to record their use by the First Nations present at the time. The architect was listening and included this as part of her presentation and was quite excited about the possibility of a re-enactment of the Champlain visit along with a First Nation's flotilla going under the bridge at its grand opening. As part of the chapter's pubic awareness mandate I have asked Robert to monitor the progress of this project and try to ensure that Champlain is appropriately noted at this National Historic site. The current provincial plaque is tuck away under the Hwy 12 bridge where only Geo-Cachers can find it. Are there any sites under threat here? So what does the archaeological record say? Some interesting developments in Orillia.